yes, that IS brown on my table - in springtime!!! but this year i just felt like breaking the mold. i love neutrals, and it's SO easy to create a neutral setting then add in a pop of color. 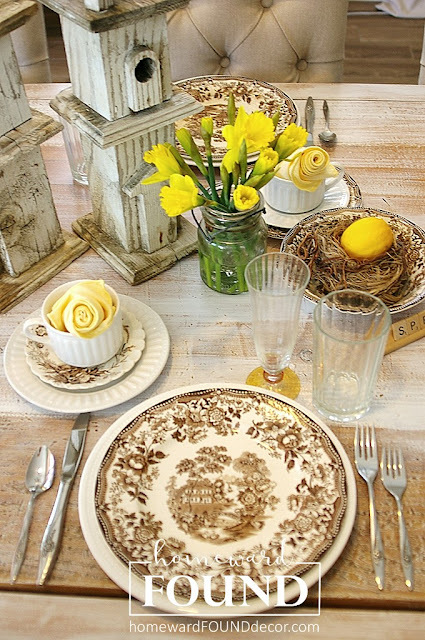 i've decorated this way for years and years, and it's never boring or limiting. continue reading to see how! adding warmth and a linear pattern that plays off of the floral transferware plates. look closely, and you'll see flowers, leaves, a stream... all VERY spring-like elements. 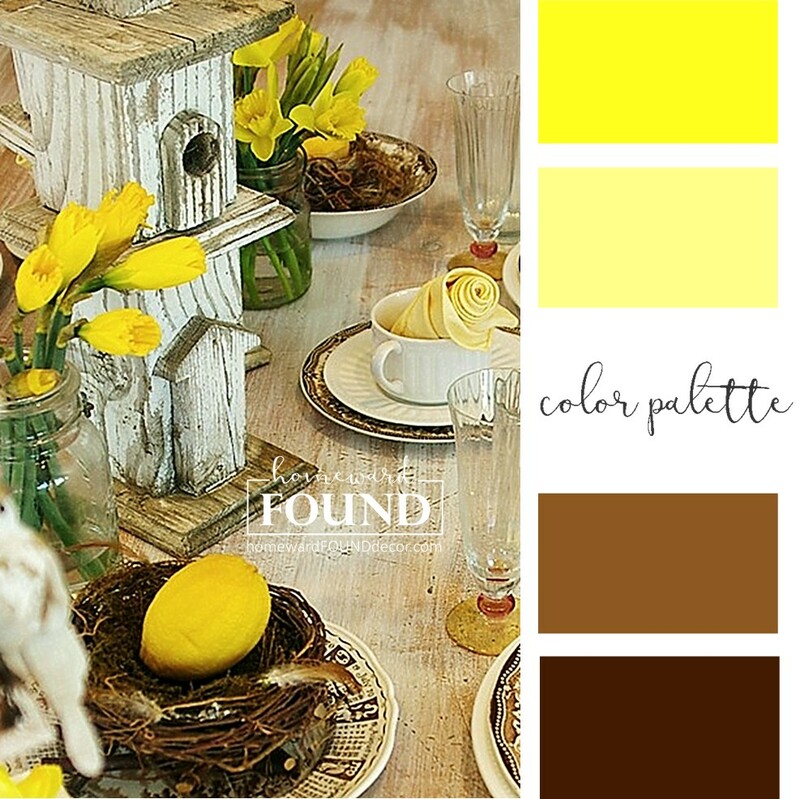 with lots of white and those pops of yellow. in the photo above, you can see how the saucers and bread plates don't match up. that's one of my tips for tablescapes: don't match. mix instead. if i had some pale yellow dishes, i'd have mixed them in, too! the simple glassware has a subtle 'lined' pattern on both the water and champagne glasses. AND to the sweet little napkin rosettes. it doesn't have to be complex and layered with a lot of elements. 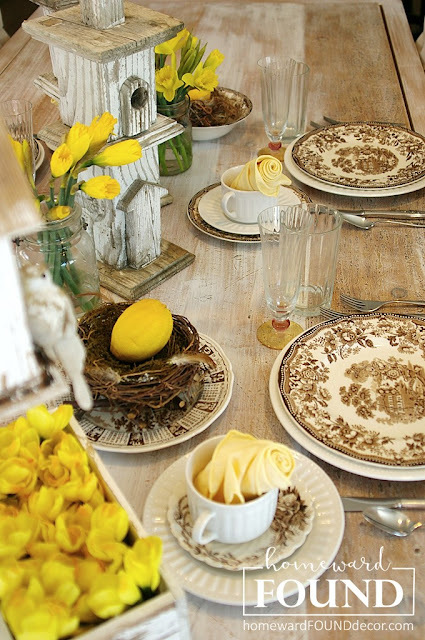 the centerpiece is simply a casual gathering of some salvaged wood birdhouses and nests. and because i do things differently, i didn't put eggs in the nests.... i put LEMONS in them! 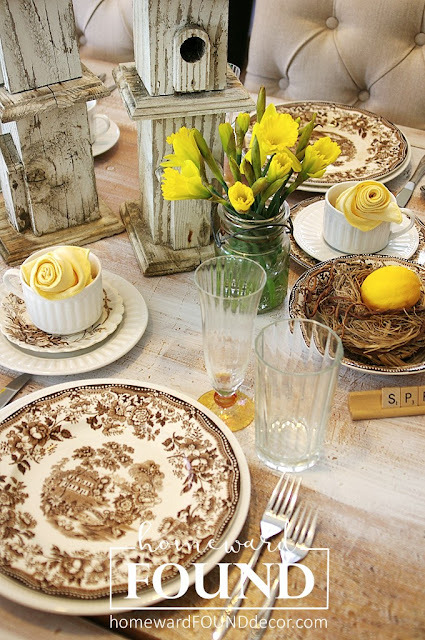 because when the table is this casual and simple, the flowers need to be, too. 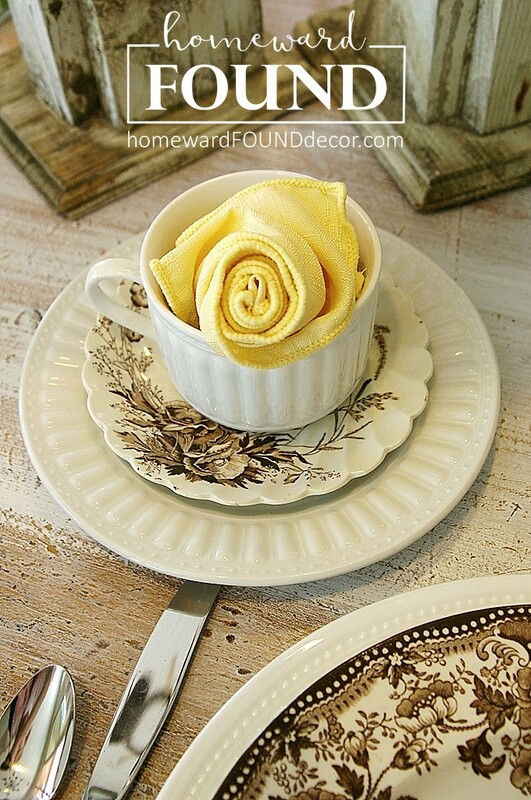 i hear you asking... "wouldn't yellow roses work, too, to pick up on the napkins & flatware?" yes, they would. if you used flopsy garden roses instead of perfect greenhouse buds. as it can get so 'same-same' that it's overlooked. besides, daffies are my favorite flower, available for such a short time in spring that i use them as much as i can! pssssst.... it's my birthday, and i'm giving YOU a gift! check out my social media accounts for a special 'TODAY ONLY' offer!